In this video, we will be learning how to solve for one variable in terms of another in linear equations, such as solving for y in terms of x. 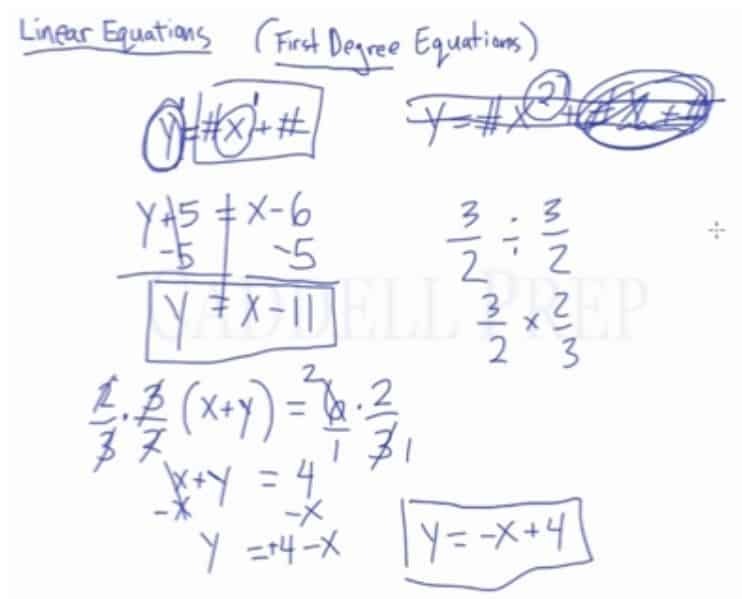 In this lesson, we’ll go over linear equations also known as first degree equations. , where and are numbers. The first thing is that we have two variables and . A very important reminder about linear equation is why it’s called first-degree equation. It’s because the exponent for the variables – and – is . The end of the equation doesn’t matter at this point. As soon as you see an exponent that isn’t 1 it’s not a linear equation. The exponent has to be one. So, what we really want to do in a linear equation is to solve for one of the variables. So what we want is some variable such as equals everything else. Whatever that everything else is. What you need to do is to isolate by itself. So, we have to do inverse operations or reverse PEMDAS to get by itself. Don’t worry about the fact that there’s here. It’s just a number minus another number. This doesn’t matter. The only thing that we want to focus on is . So let’s isolate by subtracting from both sides of the equation. What we’re going to do here is to get rid of . To do this, we just have to multiply it by it’s reciprocal. It cancels out perfectly. The reason why we multiplied it by its reciprocal is because we want to divide the fraction to cancel it out. So by multiplying by reciprocal, I actually am dividing. Maybe you want to put a denominator to , so we can cross cancel. This is okay but we want to write -term first.